Looking for Cinderella’s pumpkin, is it midnight yet? This is a comment from my friend Linda, who also brought the Cinderella pumpkin to my house where I cut it in halves and got to keep this bounty. I peeled my half with a Y-shaped potato peeler by Oxo Good grip. 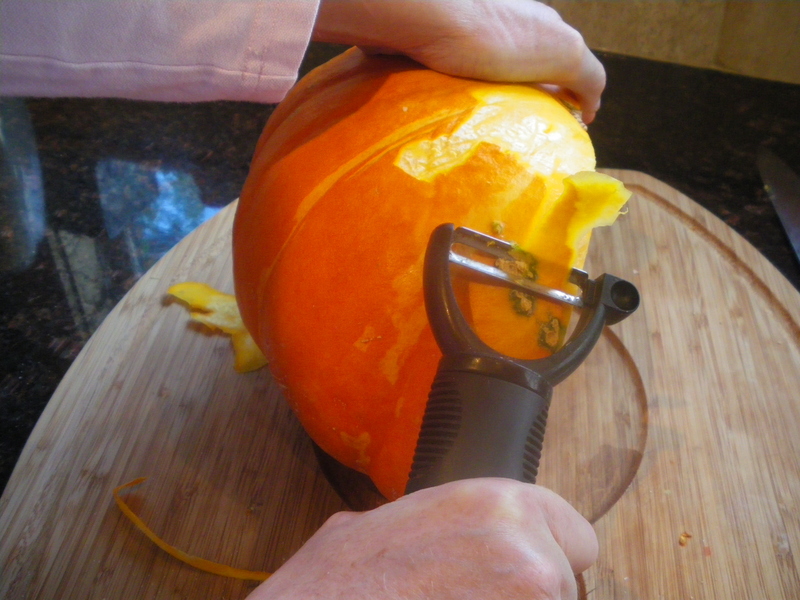 It makes it a very easy job and it means that the pumpkin can be peeled raw which is much better. So if you feel that you can no longer live without one of these peelers, and you can’t, I know, just buy one online at the bookstore, not kidding : Amazon will mail this to you now. This was a lot of pumpkin, so I roasted some of it cut in slices about 1/2 inch thick in the oven with sage and a brush of olive oil. Served with fresh ground pepper, it was really tender and delicious, almost like eating butter. 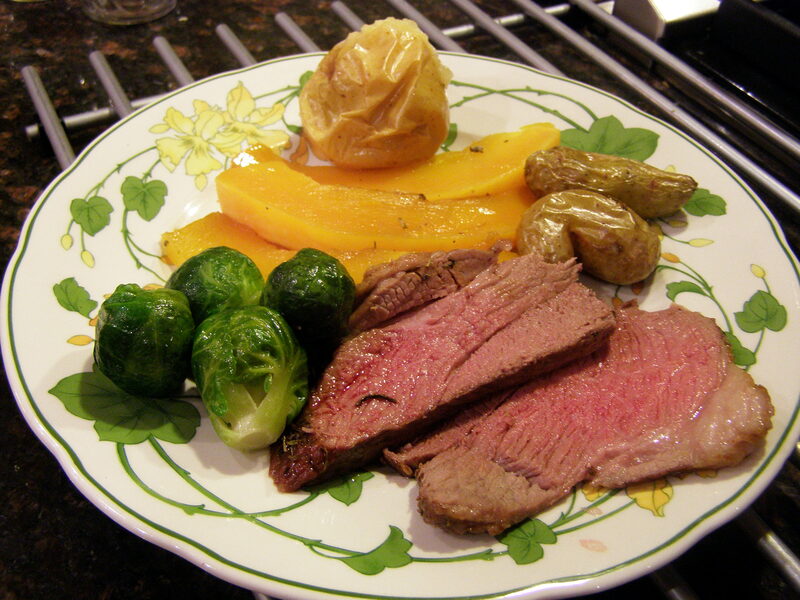 The color was a vibrant orange and looked good on the plate with the lamb, Brussel sprouts, fingerlings and baked apple. The last piece, I made into a soup with one large russet potato, 1 clove garlic and chicken broth with one tbsp fresh grated ginger added at the end, the whole thing puréed very fine and served with grated cheese, croutons, and a little dash of cream. Good enough for Cinderella herself! Just eat before midnight. Cinderella Soup best before Midnight! This entry was posted in Side, Soup, Vegetables and tagged Cinderella pumpkin, cooking, food, oxo potato peeler, pumpkin, recipe, recipes, thanksgiving. Bookmark the permalink. 5 Responses to Looking for Cinderella’s pumpkin, is it midnight yet? 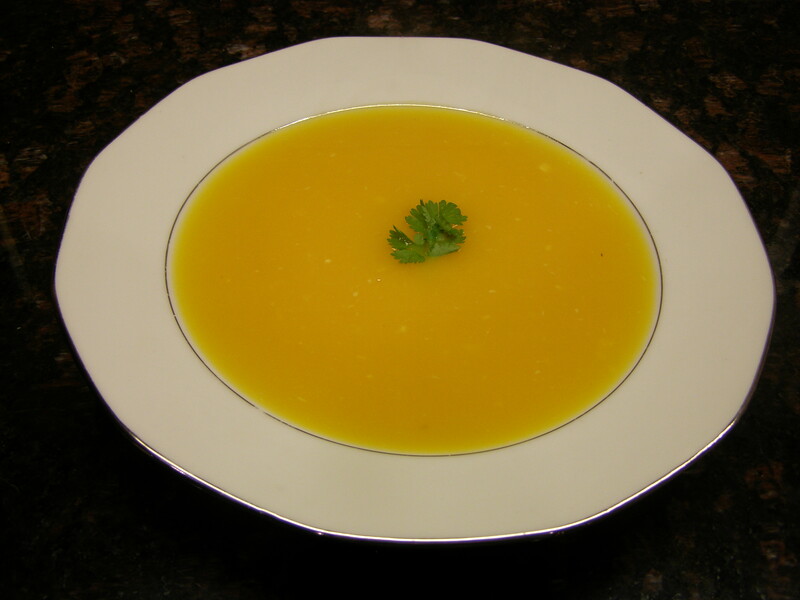 Made this soup today – delicious! so tasty, a light delicate yet unique flavour. 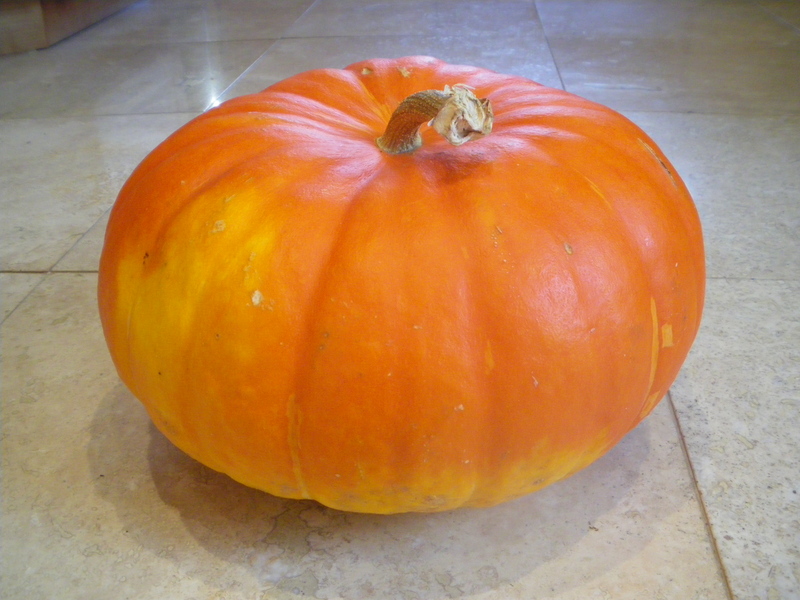 That is what I call getting the most out of a pumpkin…. it loves gorgeous.